Update: CNN beats the broadcast nets last night in prime – in total viewers, adults 25-54 and 18-34. CNN had the most watched Election Night in cable news history last night with a record 13.258 million total viewers tuning in to CNN’s Election Night in America coverage according to Nielsen Fast National data (8-11p). Fox News followed with 12.112 million and MSNBC lagged far behind with 5.945 million. Among adults 25-54, CNN was also #1 with 6.655 million, Fox News placed second with 4.638 million and MSNBC was third with 2.368 million. Among millennials (18-34), CNN tops Fox News and MSNBC combined with 3.264 million, Fox had 1.698 million and MSNBC registered 997k. CNN was also #1 during its full coverage block (7p-3a) in the key demo adults 25-54 with 5.654 million, Fox News placed second with 4.759 million and MSNBC was third with 2.128 million. CNN also outperfomed the cable news competition in 18-34 with 2.943 million, to Fox News’s 1.821 million to MSNBC’s 930k. In Total Day for Election Day (3a-3a) CNN was also #1 in the key demo with 2.423 million, Fox News followed with 2.029 million and MSNBC had 1.014 million. This represents the best day ever for CNN in both total viewers (5.097m) and in the demo 25-54. CNN was way up this year compared to past Election Nights in prime time. In 2012, CNN had 9.252 million total viewers (4.572 million among adults 25-54 and 2.718 million in 18-34). In 2008, CNN averaged 12.293 million (5.818 million among 25-54 and 3.375 million in 18-34). In 2004, CNN attracted 6.196 million total viewers (2.879 million among adults 25-54 and 1.481 million in 18-34). In 2000, CNN had 5.817 million (3.246 million among 25-54 and 1.378 million in 18-34). CNN Digital recorded its biggest global audience ever on Election Day – November 8, 2016. 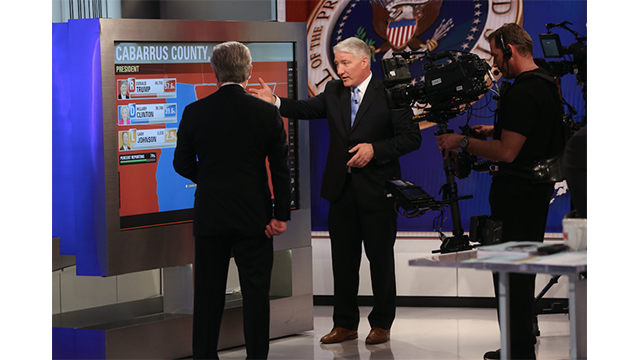 Setting all-time high records in live video, CNN saw 27.7 million live streams of its Election Night in America coverage, peaking at 11.30 PM ET with 2.34 million concurrent viewers. Total video starts for the day registered at 59 million. CNN also recorded its most trafficked day in history, serving 58 million global unique users and 424 million page views of content. Across its social platforms, CNN engaged with massive audiences on Election Day 2016. On Facebook alone, CNN saw 76 million interactions, 75 million video views and 41 million Facebook Live views. CNN engaged with 5 million unique users across messaging apps including Kik, LINE and Facebook Messenger, in addition to 5.8 million unique visitors on Apple News, and 2.6 million on Google AMP, collectively showing record-breaking reach and audience size across CNN’s ubiquitous Election Night coverage.